The winner is Jenn from Life in Bonetown. Woo Hoo!!! Wow, there were so many wonderful comments. A big thank you to everyone for their kind words and for sharing their thoughts on what blogging has meant to them. We all have a two things in common...friendship and inspiration and there is a wealth of both of those in this world. I have a favor to ask you. When there is a give away such as this one (on anyone's blog), go back to the comments section every once in a while and browse through it. Click on their names and discover someone new. Give aways bring out so many people who wouldn't normally comment and you can find some wonderful people in this world. Give it a try...you might make a new friend or be inspired all over again! ps...Jenn, email me your snail mail address and I'll mail out your package. I always click on a name or two in my comments, love to see other's sites and I have made some wonderful friends through blogging. Yea, for our Bonetown Girl! Karen, what you suggest is so true, you meet the neatest people, and find amazing blogs just by checking out a "new-to-you" commenter! I do that all the time! 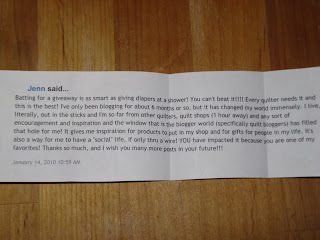 Happy blog anniversary Karen and congrats to the winner! You are right about the giveaway numbers! Congratulation to the lucky winner! I always love going through comments to find new interesting blogs! this really is a good source! Lucky to Jenn for winning.. Karen I have found half my bloggers this way you are right giveaways bring out all quilters from their sewing machines.. and they are all so talented!!! 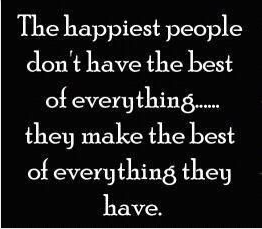 That is so true! I make a habit of clicking on the comments and have found some wonderful blogs that way. Congrats to Jenn! Congrat Jenn! How fun! I love checking out all the new blogs, one day at a time! lol That's how I got here. Congrats to Jenn.. Thanks for the great giveaway.. I love the check on other blogs through the comments section...I have found some of my favorite blogs this way. I followed a link from the HGTV quilting message board to find your blog for the first time today. What a great site!! You are so imaginative and I love the great things you make with items from the hardware stores. (I love those stores!) Thanks for all of the easy/clear instructions for so many projects, accompanied by wonderful pictures. Thanks so much for such an interesting, informative, and enjoyable site!